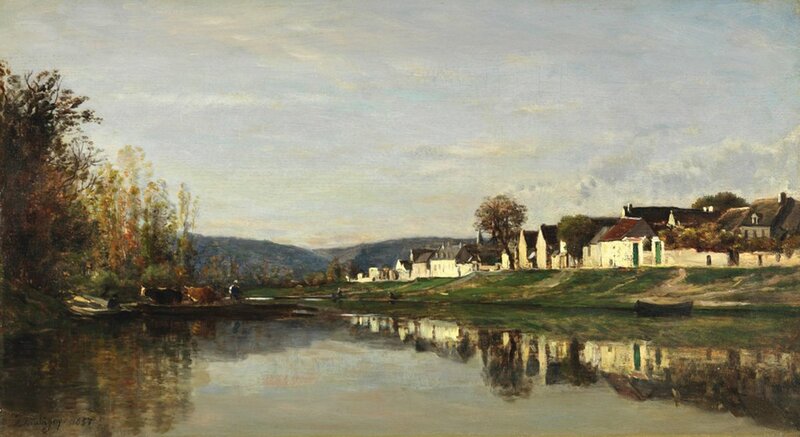 Charles François Daubigny, The Village of Gloton, 1857, oil on panel. San Francisco Fine Arts Museums. The Taft Museum of Art is the exclusive U.S. venue for “Daubigny, Monet, Van Gogh: Impressions of Landscape,” an exhibition demonstrating French realist landscape artist Charles François Daubigny’s heretofore unacknowledged status as a key forerunner for early Impressionism. This will be the first major examination of the 19th-century French landscape painter, who lived from 1817-78. Lynne Ambrosini, director of collections and exhibitions and curator of European art at the Taft, conceived of this exhibition “quite a few years” ago. The museum received a $70,000 grant from the National Endowment for the Arts back in 2013 to support planning and research for the international exhibition, which was followed by an NEA implementation grant of $45,000 in 2015. 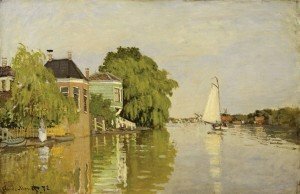 The Taft family owned three Daubigny (pronounced dough-bin-yee) paintings, so Ambrosini had been in contact with conservators at the Van Gogh museum in Amsterdam. 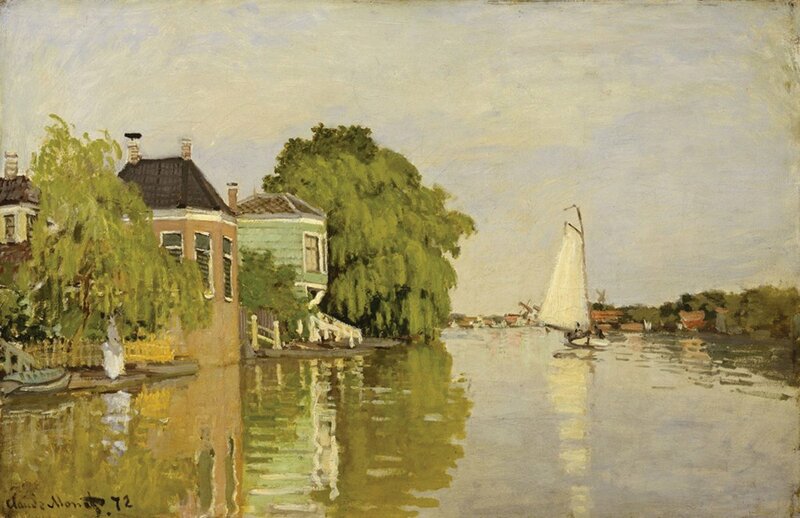 The museum oversees a private collection of late 19th century paintings owned by Hendrik Mesdag (1831-1915), a leading artist of The Hague School. The Mesdag Collection includes a large number of Daubigny works. As a collector and painter, Mesdag was particularly interested in artists’ techniques and styles of painting, and by no coincidence owned 20 works by Daubigny. Despite the dearth of attention paid to Daubigny, both Ambrosini and her contacts at the Van Gogh Museum had an interest in re-examining his work – particularly how he had an impact on subsequent generations of artists. In addition to “Impressions of Landscape,” the Taft’s Daubigny painting, the exhibition feature loans from numerous North American and European museums and private collections. Coordinating the traveling exhibition involved intensive planning and inter-institutional collaboration. Of the 55 paintings on view, 40 are by Daubigny (only one of which is in the Taft collection) and the remaining 15 offer viewers the chance to make surprising comparisons between his work and that of iconic Impressionists and Post-Impressionists such as Claude Monet, Camille Pissarro, and Vincent Van Gogh. Attention to issues of light, weather, and atmosphere (in the second half of Daubigny’s career especially) allowed the artist to begin working in ways that would have an exceptional impact on future painters. In 1857, Daubigny had a floating studio fabricated to his specifications, and this startling innovation allowed him to invent what Ambrosini refers to as a “new composition” in which you see the water rather than land in the foreground. Less than 20 years later, Monet would take Daubigny’s example and set up a studio boat himself in 1872, “respectfully,” (Ambrosini assures us) modeled on that of Daubigny’s. So not only were their final pieces similar in composition, Monet also imitated Daubigny’s procedural approach. Like the criticisms leveled at Impressionists some decade or two later, Daubigny’s later work was lambasted as “too sketchy” or even “unfinished” by the art establishment at the time. With Cincinnati ahead of the curve, Ambrosini is poised to make Daubigny’s name as familiar to art goers as Monet’s has been for many decades. Better late than never. “Daubigny, Monet, Van Gogh: Impressions of Landscape” runs at the Taft Museum through May 29. The exhibition will then travel to the Scottish National Gallery, Edinburgh, and end at the Van Gogh Museum in Amsterdam in early 2017.